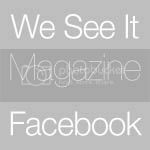 Welcome to We See It Magazine's Blog! We want to feature interviews with all kinds of creatives. Please email us and tell us about yourself and what you do. Include a link to your portfolio. We want to interview you and showcase YOUR art! We want to feature you too! Email some high res images and a description of yourself and your work to us. Remember to include a link to your blog or site.